It’s been a while since I posted a climate outlook for Georgia, but I’ve gotten a few requests so here you go. Temperatures for the next two weeks are expected to be cooler than normal. Temperatures for the rest of spring, summer and fall are all leaning towards warmer than normal conditions due to long-term trends in temperature. Night-time minimum temperatures are rising faster than daytime maximum temperatures. Frost season is most likely ended in the southern 2/3 of Georgia but is still likely through at least the end of March in northern counties. No more snow is expected in Georgia this spring with the possible exception of some northern, mountainous areas. The next two weeks will be relatively dry but wetter conditions are expected to return for the rest of spring. Summer and fall precipitation amounts are not leaning in any direction, with statistically equal chances of above, near and below normal precipitation predicted. El Niño is near peak and is expected to last through most of the growing season, and it could continue into next winter. The Atlantic tropical season is likely to be less active than usual, which could bring dry conditions later in summer and into fall. But storm paths are not predictable more than a few days ahead, so be prepared just in case. As you know, the winter had some cold spells but was warmer than average for December through February as a whole. For March so far, the northern counties have been cooler than normal but the rest of the state has been above normal in temperature. The next two weeks look like they are likely to be cooler than average for all of Georgia, but going into April the pattern should shift back to warmer than normal temperatures across the state. Looking farther ahead, spring (March through May), summer (June through August), and fall (September through November) are all showing increased chances of warmer than normal temperatures. In large part this is due to the long-term trends to warmer temperatures seen across the region since the 1960s, especially in summer. It is interesting to note that most of the increase in average temperatures comes from warmer nights rather than warmer days, which reflects a combination of more pavement and higher humidity, both of which keep night-time temperatures high. You can check trends for individual months or other time periods at https://www.ncdc.noaa.gov/cag/statewide/time-series/. We are coming to the end of the spring frost season. Looking at the longest range weather models indicates that northern counties in Georgia still have several opportunities for frost through the end of the month, which is as far as those models can look. 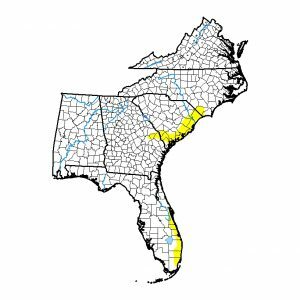 As it stands now, the southern 2/3 of Georgia looks frost-free for the rest of March. Of course it is possible we could get a late cold outbreak in April which could still cause problems for farmers, but frosts this late in the spring are rare. I have a long discussion of how to find frost probabilities at https://site.extension.uga.edu/climate/2018/02/have-we-seen-the-last-frost-of-the-year/. If the pattern shifts and frost probabilities increase into April, I will post an update. This time of year it is pretty hard to get any wintry precipitation because the atmospheric weather patterns generally don’t set up to give us that really cold air. One exception was March 13, 1993, the “Storm of the Century”, which brought 18 inches of snow to my in-laws’ house in Birmingham AL and snow to a wide swath of the East Coast, including some areas in Georgia. But the big storm that is cranking up today in the central US today is not located to bring us any snow or ice, and the likelihood of getting one so late in spring is dwindling. So I don’t think we will be seeing any more snow this year with the exception of some mountainous areas, which still have a chance. Having said that, our chances for a lot more precipitation this spring are excellent. The pattern for the next two weeks looks to be drier than average, but starting in April a return to wetter conditions is likely. Of course it won’t be constant rain, but even frequent showers can make field work difficult. Wetter than normal conditions look more likely than not for the rest of spring. After that, NOAA’s Climate Prediction Center puts us in equal chances of above, near and below normal rainfall through fall. Summer rainfall in Georgia is hard to predict because most of it is tied to small-scale weather like local thunderstorms or tropical systems which don’t show up well in climate models, so this is not a big surprise. It also depends on how El Niño evolves (see below). We are currently in a weak to moderate El Niño pattern. This means that the subtropical jet is parked across parts of the Southeast, bringing frequent rain and cloudy conditions to areas along the path of the jet, as it has for most of the winter. This year the rain has been concentrated in northern GA, while southern Georgia, especially along the East Coast, has been missed by a lot of the rainfall. The forecast for El Niño is for it to continue near peak strength for the next few months before gradually weakening in summer. The latest forecasts indicate that it may come back again in fall, an unusual double-peak since most of the time it is a one-year event. But predicting what El Niño will do in spring is tough, so don’t be surprised if the forecast changes in summer once we get past the spring predictability barrier. You can read more about the El Niño this year at https://site.extension.uga.edu/climate/2019/03/el-nino-is-very-healthy-right-now/. 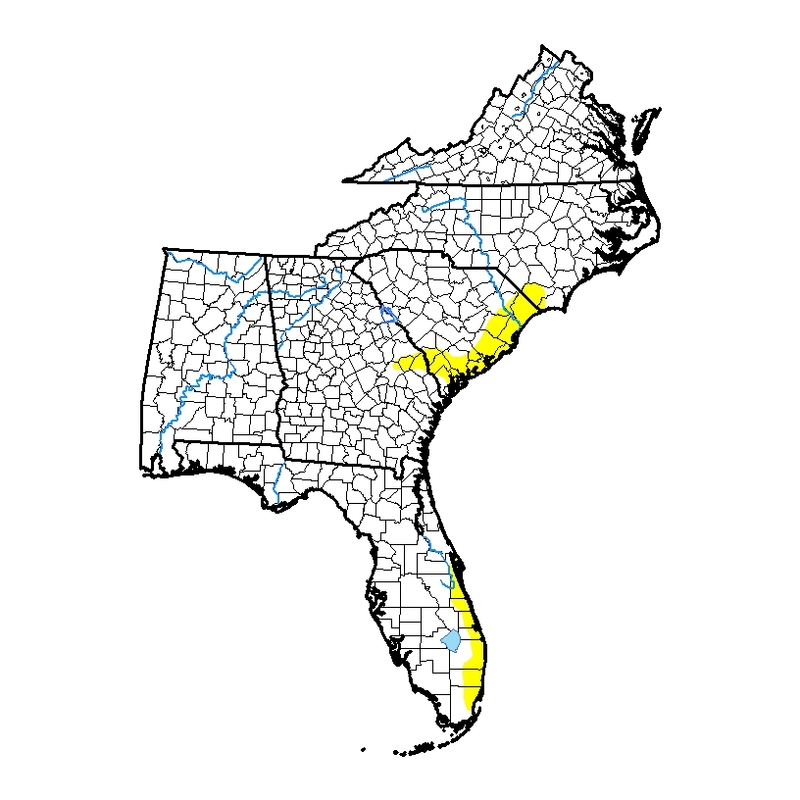 At the moment there is no drought in Georgia, but there are abnormally dry conditions present in coastal areas of the state, a consequence of being missed by a lot of the winter and early spring rains that we have experienced in northern Georgia. At the moment there are no concerns about developing into another full-blown drought this year. Most soils across the state have plenty of moisture, and in many cases, they are so wet that field work and planting will be delayed until they dry out. Some producers may have to consider switching crops to something with a shorter growing period if they get into the fields late. Some of you have asked about comparisons with 2016, which also started out very wet but got rapidly drier over the course of the growing season. I don’t think this year is going to be similar because in 2016 the onset of the drought was linked to a rapid decline of that El Niño to neutral and then La Niña conditions in just a few months that is not expected to occur this year. Georgia has been hard-hit by tropical storms the last two years, with Irma in 2017 and Michael in 2018 doing tremendous damage to different parts of the state. In El Niño years, the number of tropical systems that develop into storms is lower than normal because strong winds aloft tend to disrupt the organization of storm circulations, effectively “blowing the top off” of any storms that might be trying to form. However, even in El Niño years, it is possible to get strong hurricanes (think Hurricane Andrew in 1992). A less active season could mean drier conditions for Georgia later in summer and into fall, but if a storm does move over the area, it could do tremendous damage. We can’t predict where those storms will go more than a few days out, so you should be prepared to take care of your farms well in advance of the tropical season just in case. I hope that this has given you a glimpse of what I think we will see in the weather and climate of the next few months. If you have questions, please feel to contact me at pknox@uga.edu or call me at 706-310-3467 and I am happy to assist. Previous: REMINDER: Seasonal Vineyard and Pest Management Conference in one week!